Comparative Vacuum Monitoring (CVM) offers a novel method for in-situ, real-time monitoring of crack initiation and/or propagation. CVM is a measure of the differential pressure between fine galleries containing a low vacuum alternating with galleries at atmosphere in a simple manifold. If no flaw is present, the vacuum will remain at a stable level. However, if a flaw develops, air will flow through the passage created from the atmosphere to the vacuum galleries. 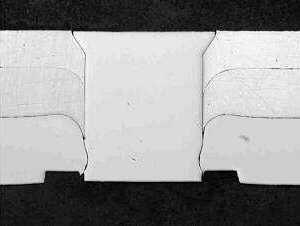 Sensors may either take the form of self-adhesive polymer "pads" or may form part of the test component. A transducer measures the fluid flow between the galleries; the rate of flow an indication of flaw size. CVM has been developed for use in both a laboratory environment or on operating equipment. The laboratory testing equipment has rapidly gained acceptance in several testing facilities within the aviation industry; often used to control a fatigue testing program due to its proven reliability and built-in fail-safe properties. A portable unit, with its own data logger, has recently been developed to allow monitoring of components in operating equipment where access to critical components is difficult, time consuming and costly. CVM has been developed by Structural Monitoring Systems, with the original patents being granted in 1995. The sensors and hardware have been continually improved, with a strong research and development program over the last decade. The hardware now consists of a rugged digital system, with sensor manufacture based on accurate CAD based design and tooling. The CVM system consists of three primary components; a sensor, a fluid flow meter and a stable source of low vacuum.For the laboratory environment, up to sixteen fluid flow meters (SIM8b) may be connected to a single vacuum source (Kvac4); the portable system (PM3) combining both the vacuum source and fluid flow meter in a single, self-contained unit with a data logger. The methodology utilises a direct measurement of the test surface; the test surface becomes one face of the vacuum/atmosphere manifold, effectively becoming part of the sensor. This has the advantage that no proxy medium (generally an adhesive) exists between the measuring device and the test component, resulting in a high reliability [1,4] and built in fail-safe mechanisms. Fig 1: SMS sensor mounted on specimen. An increase in DP results when a crack intersects adjacent channels maintained at vacuum and atmospheric pressure. A variety of sensor types have been developed. These include self-adhesive elastomeric sensors for the measurement of surface crack initiation or propagation and sensors integral within structure, for example between the faying surfaces of a lap joint. The sensors are produced from a variety of materials to suit the environmental conditions and can have a sensitivity down to 250 m m with an accuracy of better than 10 m m (4%). The sensors are inert and may be left in-situ on a test object for real-time or periodic monitoring. 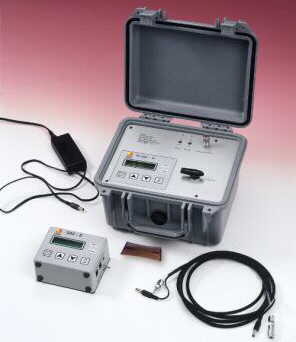 Fig 2: The SMS Laboratory Kit including a Kvac 4 (vacuum source), a SIM 8b (fluid flow meter) and a sensor. The self-adhesive sensors are manufactured from an elastomeric polymer, allowing the sensor to conform to the surface contours, including peened surfaces [2,3,4] and complex curves. Surface preparation is similar to degreasing for a strain gauge application. The sensing face of the sensor has an pressure sensitive adhesive layer applied at manufacture, allowing the sensor to be installed in much the same way as a self-adhesive label and without the requirement to heat cure, which may effect the material properties of the component under test. The elastomeric properties of the sensor material (~7%) allow the sensor to conform to any strains applied to the test component without affecting its ability to detect crack initiation - the sensors have performed equally under all loading conditions applied to date. Further, the sensors do not suffer the restrictions of wire crack gauges and the like, which have a high probability of failure if a bending moment is repeatedly applied to the sensor. The CVM system will give a false positive reading in the unlikely event of a sensor disbond, allowing the test program to automatically shut down before a catastrophic failure of the specimen can occur. CVM has been developed primarily as a tool to detect crack initiation. Once a sensor has been installed, a base line reading is made. Generally, the differential pressure between the reference vacuum (Kvac) and the sensor will be approximately 0 Pa. However, if there is a known existing flaw beneath the sensor, or the permeability of the test material is high, the fluid flow meter (SIM) will measure a non-zero base value. If this non-zero value is constant, it will not affect the ability of the CVM system to detect an increase in total crack length. When a vacuum gallery is breached by a crack, molecules of air will begin to flow through the path created by the crack. The SIM contains an impedance to the flow of air, with the fluid flow being measured as the difference in pressure between the sensor input and the reference vacuum level. Once the system has reached an equilibrium flow rate, the volume of air passing through the crack is equal to the volume of air passing through the SIM; the measured differential pressure will become constant at a higher value. In this way the SIM is very sensitive to any changes in the total crack size. The CVM method is unable to differentiate between a single large crack and several smaller flaws, however is sensitive to any increase in the total crack length. The sensitivity of the sensor is determined by the gallery wall thickness, determining the shortest crack that may be detected. A test program was conducted by DSTO [Defence Science and Technology Organisation, Engines and Airframes Division, Melbourne, Victoria, Australia] in 1996 [2,3,4] to determine if CVM and Holographic Laser Interferometry (HLI) could be used to detect cracks on peened surfaces. An additional complication to the test program was the specimen type generally fails from a corner crack, so the NDI methods had to be applicable to these corner regions. Figure 3 shows the CVM sensor, as set-up on the specimen, and the galleries in the sensor after the specimen was broken. The gallery wall thickness is 250mm. Due to a limited number of specimens the HLI was used post CVM detection. 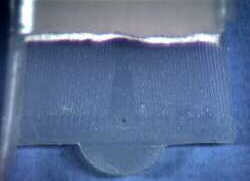 Fig 3: Picture of CVM system on a peened specimen surface. The capillary wall thickness is 250mm. Two coupons were used, the first specimen to generate a CVM output vs. crack depth curve and the second to confirm the result. The specimen failed from a corner crack, with the progress of the crack throughout the test determined by quantitative fractography. Figure 4 shows the CVM response with number of programs, as well as the crack growth behaviour. Figure 4 suggests once the initial atmosphere/vacuum breach has occurred, that CVM will respond to crack growth. Fig 4: Plot of CVM system output (kPa) versus crack depth (mm) per spectrum program number. A second peened specimen was used to confirm results obtained with CVM. Once the alarm sounded, the crack was located and eddy current and ultrasonic inspections performed. The specimen was broken open to reveal the size of the crack. The crack surface lengths measured were 720mm on one face, and 780mm on the other. Neither of the traditional NDI techniques located a crack. The SIM has digital, analogue (0-5 Vdc) and relay outputs. These allow the unit to be connected into most shut-off protocols utilised by testing machines. Several laboratories, both in Australia and internationally, have developed a level of confidence in the CVM technique and its inherent fail-safes that they allow the SIM to control all of their testing programs without the presence of a technician. The laboratories now depend upon CVM to shut down the test before catastrophic failure can occur. The CVM technique has been extended to crack propagation measurements. The crack propagation system utilises a sensor with a manifold of individual galleries at a known spacing. As the crack propagates under the sensor, it will breach each of the galleries in sequence. Figure 5 shows one of the standard crack propagation sensors. Fig 5: A standard crack propagation sensor. (All dimensions are in mm). 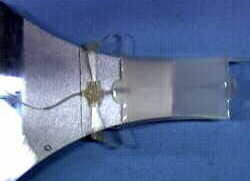 The crack propagation sensor is sensitive to the crack tip position. Immediately the crack tip breaches one of the galleries, the CVM system will measure a change in differential pressure. For these crack propagation measurements, measurement of the crack growth by the sensor has been automated - each gallery is monitored sequentially. The automated crack propagation measurements may be interfaced with the automatic shut-down protocol of the test machine, enabling the test to be ended once the final gallery has been breached. The accuracy of the crack propagation sensor is governed by the accuracy of the galleries, measured optically at better than 10 m m. Once the sensor has been installed, the leading edge of the first gallery is determined optically, and from this initial measure all subsequent gallery positions are determined - there is no further calibration. Fig 6: Crack propagation measurement of a CCT panel test to compare CVM crack propagation measurements to other standard techniques. Figure 6 shows a comparison of the CVM crack propagation method to optical and EDP (Electrical Potential Difference) techniques on a CCT panel test. 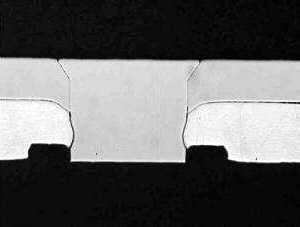 The panel had a central crack initiation notch made, with EPD used to determine the total crack length and therefore an average length either side of the notch. EPD suffers from being non-linear, and hence difficult to calibrate and use. To the left of the notch the crack was measured optically with a travelling microscope. To the right, a CVM crack propagation sensor with galleries equally spaced at 1mm was used, the calculated crack length on the right side was produced by subtracting the optically determined value from the total EPD calculated crack length. To the right of the notch, the calculated and CVM (SMS) values agree very well, with discrepancies due to difficulties in discerning the crack tip optically to the left of the notch. The CVM crack propagation method is inherently linear, and once the sensor has been installed on the specimen and the leading edge position of the first gallery determined, there is no further calibration necessary. The Fraunhofer Institut [Fraunhofer Institut, FhG Prototypenzentrum Dresden, Germany] in Germany is using the sensors to determine the yield stress in the parent material surrounding a punched rivet. Punched rivet technology is being widely exploited by the automotive and rail industries in Europe to replace welding in the manufacture of automobiles and rail cars. When the fastener is first inserted the parent material surrounding the rivet is elastically deformed, forming a tight seal about the rivet by relaxing once the joint has been made. A circular sensor is placed concentrically over the rivet head, the surface of which has been lightly finished to smooth the interface. Radial vacuum and atmosphere galleries alternatively cross the rivet/parent material interface. Fig 8: Single joint specimens in static test. Figures 8a and 8b show the results of static tests with single joint specimens (one rivet). The CVM system is indicating the local yield stress in the parent material surrounding the rivet. As the yield changes from elastic to plastic, when the load curve changes from linear to curved, the gap at the rivet head (Figures 7a and 7b) opens allowing air to pass between the atmosphere and vacuum galleries and a large differential pressure is measured. Fig 7: Examples of punched rivet joints with two (a) and three (b) plates. The results are reproducible and similar results have been achieved with double joint specimens (two rivets). To date there has been no reliable in-situ method of determining when a riveted joint's yield changes from elastic to plastic. The Fraunhofer Institut is repeating the measurements with a cyclic load to determine how the results will differ. PERIODIC MONITORING OF ASSET INTEGRITY. The CVM technique can also be applied to the periodic monitoring of critical components in operating assets, particularly components that require time consuming dismantling of surrounding structure to access. The inert and passive sensors are fixed to the locations requiring monitoring and sealed, with the vacuum tubing ducted to a convenient access point. A fully self contained and portable CVM unit has been developed to allow periodic monitoring and data control of critical components in equipment. The portable CVM monitor contains the vacuum source and fluid flow meter in a single box, with its own battery and a hand-held data-logger. The CVM monitor is connected periodically to the sensor system, as part of a regular inspection program for the integrity of the asset. Fig 9: Schematic of the SMS Portable Monitoring system. Figure 9 is a schematic representation of how the periodic monitoring system would operate. The sensors are installed on the equipment with the vacuum lines ducted to a convenient inspection point. The operator would connect the portable monitor to the sensor system and apply vacuum. The data logger records all of the information and displays it graphically, with the whole operation taking less than five minutes per sensor. Fig 10: Pump down curves of two sensor systems. Prior to vacuum being applied to the sensor, the sensor system is at atmospheric pressure. When vacuum is applied, the sensor system produces a unique pump-down profile as the air molecules within the sensor system are "pumped-out". This baseline pump-down profile is stored in the data logger as an X-Y curve and permits the operator to determine if the component is undamaged and that the sensor is in good condition by ensuring that the pump-down and baseline curves match. This verification procedure will immediately identify structural condition or a change in system integrity. If a crack has initiated, the pump-down curve asymptotes to a higher final value. If there is a blockage within the sensor system, a smaller total area under the pump-down curve will be observed. If the vacuum ducting has been cut or if the sensor has disbonded, the reading will remain near to a full-scale constant reading. The data logger contains algorithms that recognise these conditions and informs the operator in plain language the status of the system. SMS has entered into collaborative agreements with the Royal Australian Air Force to determine the durability of the sensors in severe aircraft operating environments. Similar agreements are currently being finalized with a second major military organization, for use on its helicopters, and with a manufacturer of civil aircraft. The CVM concept has been well proven in the laboratory environment, and the sensor system material selection is being validated under the harshest possible environments. There is a strong commitment to research and development of CVM. The test programs are often client driven and approached in a collaborative nature. Two such research programs are listed below. A concerted research program  is underway between SMS and an aircraft manufacturer to develop a crack initiation sensor within the sealant between the faying surfaces of a lap joint. Initial crude measurements have shown the technique to be viable, detecting cracks <2 mm in length within several test specimens. The technique is being further refined to allow sensitivity similar to the self-adhesive sensors, effectively without adding any weight to the aircraft. This technique is of particular interest for use with new hybrid materials where traditional NDI methods simply do not work. A collaborative program to investigate the opportunities for installing sensors into composite structures has begun with an Australian Government materials technology agency. The program has the particular aim of producing a "smart structure" in boron patch repairs. The program involves designing a sensor into the boron repairs such that they may be monitored continuously. The use of permeable fibres within the sensors will allow the boron patches to self-determine if the repair is about to disbond. CVM is a new NDI technique, possibly the only truly new technique to be developed in the last two decades, with its applications being developed and driven continuously. CVM offers an easy to use, sensitive and reliable method of determining surface crack initiation and monitoring the crack propagation rate. Research into integrating the sensors within structure, both lap-joints and composite, is well developed allowing for the possibility of true smart structures without any additional weight to the asset. The technique has been validated in several well-respected research laboratories internationally and is now developed for operating equipment. CVM offers an inert, in-situ detection system for monitoring critical components without the need to remove surrounding panels and fixtures and with built in fail-safe indicators. Wheatley G. and Davey K. (submitted) On the Early Detection of Fatigue Damage in Riveted Lap Joints, Fatigue Fract. Engng. Mater. Struct.